Back in the days when Lynne and I were young girls and joined each other's families on trips, she taught me how to play Counting Cows. I'm sure everyone has their own rules and points for this game, but basically, every cow I saw out my window was worth a point. A gray mule equaled twenty cows, and a white mule was a hundred cows. If we came to a cemetery on my side of the car, Lynne could shout, "Bury your cows!" and I was back to zero. Or vice versa. The point was to DISTRACT your opponent so she didn't see the cemetery, because once past it, your cow points were safe. These days, since I live a mere mile from downtown Houston, I'm sure most people wouldn't guess that we actually have a herd of cows on the The Compound. Nobody can accuse us of being all hat, no cattle. Today, while shopping, I found a cow with three legs for three dollars. (This reminds me of a terrible joke my brother once told me about a Valiant Pig, but I digress. As I should. I'm a SOUTHERNER.) Now who wouldn't buy a cow for three dollars? Especially when its missing leg came with it. I wouldn't have to trade this cow for a handful of magic beans. I could do cow surgery! So now Vincent Van Cogh has moved onto The Compound and been restored to good health. Post-surgery, only I know which leg was broken. 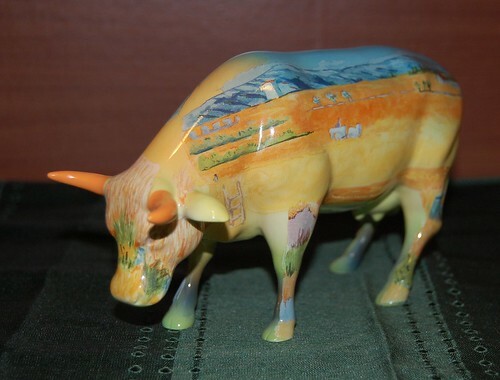 Yellow Rose of Texas, 2001 Cows on Parade, gift of Lynne; Americow the Beautiful, 2002 Cows on Parade, gift of Tom; J.K. Cowling, a Literary Cow, gift of Todd; Blue Dog Cow, 2000, gift of Amy; and Vincent Van Cogh, 2000 Cows on Parade. As opening day of the Rodrigue exhibit approached, John Bullard, director of NOMA, teased the meticulous Rodrigue by secretly altering the direction of a few of the tiny blue bovine -- creating what he called "independent cows." 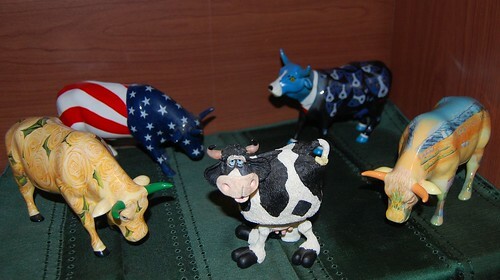 Not to be outdone, Rodrigue retaliated by painting three of the cows scarlet. How could I not appreciate this intersection of cow and Blue Dog lore? The Photo Friday site is on vacation, so my next Photo Friday shot will be on August 14.